Which Samsung smartwatch should adorn your wrist? Despite the Samsung Gear Sport rolling around this holiday, Samsung still considers the Gear S3 its big flagship device. That's right, the Gear Sport isn't exactly the Gear S4. Instead, the Gear Sport is more like a much sportier version of the Gear S2. The Gear S3 is more of a traditional smartwatch, including big features like LTE connectivity and a larger size. That can be confusing if you're looking for a new smartwatch and you're leaning in Samsung's direction. Do you go with the new hotness that is the Gear Sport, or what Samsung considers its crown jewel, the S3? Luckily for you, we've put together this guide to help you along. The Gear Sport and Gear S3 are a good lesson in how different you can make two products while retaining several signature touches. All you have to do is look at them to see. The Gear S3 comes in two varieties; the more adventure-y Frontier and the more sophisticated Classic. The Gear Sport is a little more colourful, and comes with a fairly unique square-circle shape that makes it look like a round watch was stuck onto a square frame. We've found it to be a little divisive. The Gear Sport also has a 42.9mm case that weighs in at 67g. Meanwhile, the Gear S3 is a chunky monster, with a case that comes in at 46mm, though it's a lighter 63g for the Frontier and 59g for the Classic. There are only a couple of differences between the Classic and Frontier. The Frontier is a little more rugged and has the bezel raised above the rest of the watch case. The Classic is more subdued, with cleaner buttons and a bezel blended into the case. In the looks department, it's hard not to go with the S3 Classic. It looks like a standard wristwatch in the best way, and it's the one that you'll be able to pull off with any look – whether you're headed to the store or off to a wedding. The Classic will also give you a leather band, while the Frontier and the Gear Sport get you a more rugged, sporty plastic band (though these can be swapped for others). Straps on the Gear Sport are also more narrow, coming in at 20mm rather than the S3's 22mm. The Gear S3's display is slightly larger, at 1.3 inches compared to the 1.2 inches of the Gear Sport, but they both have roughly the same 360 x 360 resolution AMOLED displays. Both of these devices have heart rate sensors on the underside, but only the Gear Sport has 5 ATM water resistance. The Gear S3 has an IP68, but that's mostly going to help you out if you're looking to take a shower or run in the rain, rather than more extensive lap work in the pool. The Gear S3 is a clear winner when it comes to looks. It's a classy, round smartwatch that looks as good as most regular analogue watches. It is plenty chunky though, which might be too big for a lot of people, making the smaller Gear Sport potentially more appealing for those who have smaller wrists – or even those who appreciate unique design quirks. The basic undercarriage of the Samsung smartwatch experience is the same across the Gear Sport and Gear S3. Both of these devices are running Tizen, which means you'll have access to the Gear app store to download apps, including the Under Armour suite. You've also got things like offline Spotify playback, which will allow you to sync over music from Spotify. This is a huge boon to the many people who use Spotify and want to keep their music without relying on their phone. You can also store music files separately in the 4GB of storage space. The Gear Sport's 5 ATM water resistance gives it a sizable sports advantage over the S3, but they both have solid GPS, so you can head out for a run phone-free with either model. Where these two diverge is Samsung Pay. They both have it, but one has a better version of Samsung Pay than the other. The Gear S3's Samsung Pay has the ability to use magnetic strip readers, which turns any pay terminal into a contactless pay terminal. The Gear Sport only supports Samsung Pay via NFC, which means you'll only be able to use compatible contactless terminals. The other big difference is that the Gear S3 comes in a version that enables LTE connectivity, while the Gear Sport will have to rely on your phone for the most part. This of course is a potential deal breaker for those of us who like to leave our phones at home, keeping us connected without fully being connected. The Gear Sport actually had the feature advantage for a little bit, but then Samsung released the Tizen 3.0 Value Pack update, which brought the Gear S3 back up to feature parity. 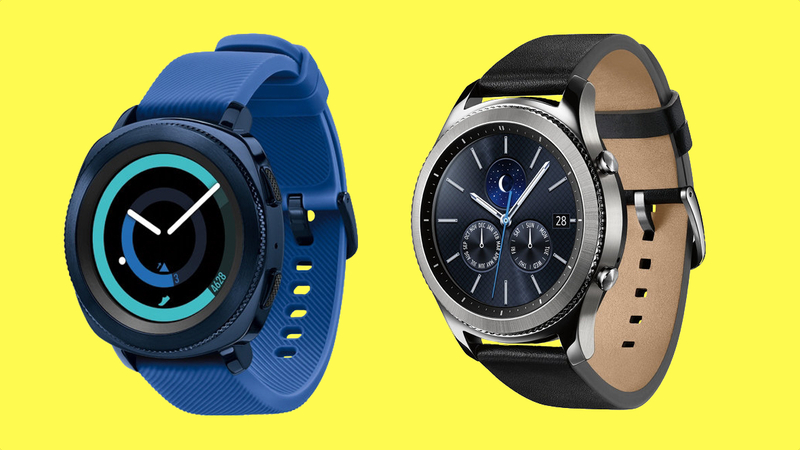 The only major differences here are in hardware, with the Gear S3 having that LTE connectivity, lesser water resistance for swimming, and a magnetic strip reader in a more robust version of Samsung Pay. Samsung Health has grown into a competent and mature health platform, and you can even sign up to get virtual doctors' appointments right from your phone. For the most part, the Gear Sport and S3 have similar health and fitness experiences. You'll get the full benefit of both Samsung Health and Under Armour's suite of apps, which includes MapMyRun, Endomondo, and MyFitnessPal. The Gear Sport, because of its better swimming ability, will also get you the Speedo On app, which will be handy if you hit some laps. In our testing of the Gear Sport's swimming ability, we actually came away a little disappointed. Samsung's own app was inaccurate, and while the Speedo app worked better it wasn't great at accuracy when it came to pool lengths. Swimming – and Speedo On support – is the big difference between the Gear Sport and Gear S3. For the most part, the rest of the experience is largely the same. Both devices also struggle with heart rate at more intensive levels, though they go about it a little differently. The Gear Sport constantly feels like it's catching up in the heart rate department, and if you're looking to do intervals you might as well forget it, but otherwise it should serve its purpose. The Gear S3, on the other hand, will sometimes record abnormally high heart rate readings. One thing to not forget is that the Gear Sport is also considerably smaller than the Gear S3. And while the Gear S3 has LTE connectivity, which means you can truly leave your phone at home while you run, the smaller size means using the Gear Sport is not only easier on your wrist, but can be used by more people. All of this helps make the Gear Sport true to its name, and a better health and fitness device than the larger Gear S3. When you've got better GPS performance and 5 ATM water resistance in a smaller package it's hard to go against that. The Gear Sport and Gear 3 both gave us around three days of battery life in our tests, though we were also able to push to four days on the S3 when we turned off the always-on display mode. On the Gear Sport, we were bouncing between three and four days. On both devices, GPS use will knock down that life considerably. These two devices also have Watch Only mode, which will give you an insane 40 days of battery life. This is all especially impressive for the Sport, which has a 300mAh battery compared to the Gear S3's 380mAh battery. So if you're looking for battery life efficiency, the Gear Sport is the winner here. The pricing between these two smartwatches depends on where you buy them. Samsung still looks at the Gear S3 like its flagship smartwatch, and in the US it prices it like its flagship smartwatch at $349.99 – and that's not counting the $10 a month extra you'll have to pay for LTE. Meanwhile, the Gear Sport comes in at $299.99. Over in the UK, the Gear S3 Classic and Frontier will set you back £249.99, with the LTE models adding £5 a month to your bill. The Gear Sport, however, will see you pay £299.99. That makes the Gear Sport more expensive than the flagship in the UK, but less expensive in the US. The Gear S3 might be what Samsung calls its flagship, and it might even have a couple of features that the Gear Sport can't physically have, but the Gear Sport is our favoured choice here. That's for a couple of reasons. The first is that it takes most of what the Gear S3 does and miniaturises it, making it a better choice for most people since the Gear S3 sometimes feels monstrously huge on the wrist. The second is that it has 5 ATM water resistance, so you can take it for a swim and not worry about it. It's also, at least in the US, more affordable than the Gear S3. While you are missing out on LTE connectivity, Spotify offline playback helps mitigate that a little bit (it's also available on the Gear S3 of course, but still). If you're looking for the best Samsung smartwatch, the Gear Sport is your model.